If we wish to acquire maximum pleasure and to minimise pain we can reduce it all to brain chemistry. Some try to achieve the goal artificially through the use of legal and illegal drugs, but in doing so the pleasure is usually not worth the pain. There are far more benign ways of gaining intense pleasure without also receiving pain, but obviously what can be pleasurable for some people can be boring for others. Benign pleasure for some can be gained through travel, and I have had my share throughout my life. Nowadays however, I don’t have the same drive. I find there are better alternatives. And when I do travel it is usually confined to the Berra area, although I had a good trip to Lord Howe Island about a year ago. When I say I like to travel within the Berra area, I do my best to avoid the shops and suburbs. The Berra is now far too overpopulated for my liking, but fortunately there is still plenty of bush and wildlife surrounding it and plenty of interesting history to experience if you know where to look. I have recorded and uploaded onto youtube a video that contains various parts of my day on the 2/2/16, which includes a run up Tuggeranong Hill, a trip to the Tuggeranong Axe Grooves and my trip to Jerangle. Although I am no Cecil B DeMille you may find some of what I have filmed interesting. The video is entitled, “Dave Wheeler visits Jerangle.” It's embedded at the base of this anecdote. The 2/2/16 was a day like many days I experience in my semi-retirement. It was very pleasurable and it had a definite absence of pain. I really enjoy not having to get up and go to work every day. I began the day with my regular run with my grandog, Coda, up Tuggeranong Hill, starting from my house. Although I run at glacial speed I hold 5kg hand weights in each hand, which increases the intensity of the workout in proportion to the slope of the ground. Coda, my grandog, who I run with. I only shuffle when I run, but the hand weights give a steady but intense workout that does not stress the joints considering the weights are too heavy to be ballistic. At the end of the run I feel as if I have had a good overall workout, whereas if I run without hand weights I do not. I'm not trying to boast about my fitness, as I turn 64 this year (2016) and as such am an old man with an old man's cardiovascular and muscular systems. I'm saying that because it's a steady tax on the heart, lungs and muscles it gives a workout that is relaxing, meditative and intense, yet paradoxically not that difficult relative to other forms of exercise. After I reached the top of Tuggeranong Hill I slowly walked down. The feeling can be euphoric as the endorphins are pumping. When I'm back down on the slopes of the hill behind the fire station I usually do a few half speed sprints, which tax the heart, lungs and muscles in a different way. I did that on the 2/2/16, which made me feel even better. I topped it off with some shadow boxing and stretching. Sometimes I combine the shadow boxing with some moonwalking, although I'm no Cab Calloway. (Cab Calloway popularised the moonwalk in the 30's even though he did not invent it). Above is Tuggeranong Hill. When I run I like to wear toe runners, as they are devoid of heels and they hug closely the natural curvature of one’s feet. They are as close as possible to running in bare feet. Since our prehuman days there has been no change in the structure of our feet, which means that natural selection did not need to change their structure. If it was to our evolutionary advantage to have heavily padded feet and for them to have an elevated heel or a lot of padding like a running shoe, we would be born with heavily padded feet and an elevated heel. As we are not born that way we can deduce that the best shoe we can have to run with is one that sticks as closely as possible to the contours of our feet. As an experiment try walking or jogging in bare feet. You'll notice that almost all the force you receive as you land goes to the top part of your foot, which lands something like a judo break fall and which absorbs the blow with the foot and calf muscles. Conversely, when running with a heeled and padded shoe the force goes partly up one's heels to the knee, hips and lower back, which can be damaging. Also, if you place your hands on your VMO's while running in bare feet you will notice they are contracting and as such also getting a workout. Undeveloped VMO's often cause or contribute to knee problems. The only negative involved in running with bare feet or toe runners if you are not conditioned to it is that your feet will travel along a slightly longer arc than you would have experienced with running shoes, due to the absence of a heel and they may stress your carves as muscles you have never before used are used. For that reason should you begin for the first time running in bare feet or toe runners I suggest you begin with small distances then gradually increase the length of your run. If you don't you may have problems with overstressed muscles. When we returned home I drank some water then closed my eyes and listened to Jerry Lee Lewis singing, "Your cheating heart" on youtube. Again, I received another benign shot of positive brain chemistry. I have embedded it below. You may enjoy listening to it as you read. Like many brilliant muso's Jerry Lee is a disturbed man who has led a life of self-destruction. And even though he has lived a relatively long life he would have experienced many years of poor health and mental torment. He, like other muso's however, has given me continual pleasure, for which I am grateful. I wanted more benign pleasure, so I listened to Sol Bright do "Hawaiian Cowboy," which tells of an Hawaiian cowboy's love of his horse, Rosalani. After then listening to Freddy Fender singing "Corina Corina" in Spanish for the second time that morning it was time for Coda and me to go to Jerangle. Our first stop was the Tuggeranong Axe Grooves. (You will find the event is out of sequence with the events that I show on the youtube video I produced below). The grooves were made by the Ngambri many years ago as a result of the process involved with them creating and sharpening their stone axes. The grooves are situated on a sandstone outcrop. Sandstone is not common in the area. They must have found it a superior rock to work with than granite. The grooves could also be used to grind seed and to collect water as shown in the closest photo. Pictured above are the Tuggeranong axe grooves. Unfortunately they were recently vandalised as a result of someone "cleaning" them with bleach. It was obviously not deliberate vandalism. In the video I made I was very critical of the person who vandalised the grooves, but after giving it some thought I believe the guilty person probably had an intellectual disability and "cleaned" the grooves because they thought they were doing the right thing. On I went with Coda along the Cooma Road until I came to Bredbo. I then turned left and headed towards Jerangle, which is on the Jerangle Road, about 30k's to the east of Bredbo and Michelago. It's a dirt road most of the way and the scenery through the Tinderry Mountains is beautiful. Jerangle has an elevation of 1120 metres as opposed to the Berra which is approximately 580 metres, so it can get quite cold. The other end of the Jerangle Road begins at Captain's Flat. If you look hard you can find Jerangle's location on the map below. Jerangle, which would probably be classified as a hamlet today, would have been classified as a village at one stage. Like many villages throughout Australia it diminished drastically in size as a result of agriculture employing fewer people due to labour saving technological changes and people owning faster and more reliable cars preferring to shop in larger places. Nowadays Jerangle has, apart from a few abandoned houses and abandoned buildings that were used for other purposes, a few residential houses, a primary school with a small number of pupils, a CWA (Country Women's Association) Hall where the local CWA meets, a functioning Catholic Church, a functioning Anglican Church, tennis courts, a telephone booth and a cemetery. I could not get mobile reception at Jerangle. At one stage Jerangle also had a resident copper and overnight gaol, a general store, a pub, a telephone exchange and a post office. When those services closed it would have become a very different sort of village. It's very difficult to get any information about Jerangle on the net. The Cooma-Monaro Shire Council once had a link that showed a page that gave a good overall history of Jerangle, but unfortunately the page is no longer there and I'm relying on my memory of what it said. As such I stand to be corrected when I say that I believe Jerangle's general store closed in 1962 and the copper left in or around 1942. I cannot recall when the other facilities were closed. According to Wiki, Jerangle had 227 residents in 2011, which would obviously refer to the Jerangle district. It would not be referring to the people who lived between the Jerangle name signs unless they were counting the decomposed folk buried in the Jerangle cemetery. When I approached Jerangle unfortunately there was roadwork being carried out near the school. Jerangle is not usually a hive of activity, but with my luck there was a lot going on that day, and as I could not park where I wanted to I forgot to take a photo of the Catholic Church. I drove on and had a look at what remains of the old closed general store, which is located towards the other end of Jerangle and is shown below. I then turned around, came back a bit and turned right and drove towards the cemetery. I found near the next turnoff, which went directly to the cemetery, in the middle of the road, a southern or blotched bluetongue lizard, which I photographed, below. As I have said, I can get very little information about the history of Jerangle on the net. The local primary school, which has its own website, says the school was established in 1884, although I read elsewhere it celebrated its centenary in 1992. Maybe they got a new building in 1892. I do not know how many pupils attend the school. The school website link is below. If anyone has written up a brief history of Jerangle I am happy to publish it on this site and correct anything I have stated about Jerangle that is incorrect. The net can be deceptive. When you enter a place name in the Google search engine those desperate for a quid try to link it to a multitude of businesses that purport to service the place. After I googled Jerangle the search produced one particular business, a matchmaking company, that said it could unite, for a fee, Jewish singles living in Jerangle. The photo below is of what remains of the Jerangle General Store, which I am led to believe closed in 1962. If you click on the photo you may be able to see the old ad's for Billy Tea. If someone were to buy the store, do it up and reopen it, I am sure they would become a multimillionaire in no time. The photo above is of a magnificent southern bluetongue skink, aka as the blotched bluetongue. I took the photo not far from the Jerangle cemetery. The southern bluetongue differs to the common bluetongue in colouring and is slightly shorter in length. It is confined to certain areas within SE Australia, including Tasmania and the islands of the Bass Strait. It cannot be found any further north than the Blue Mountains, and within NSW it seems to be restricted to areas of higher altitude. I have only seen southern bluetongues from near Captains Flat along the Jerangle Road to Cooma, and beyond to Bombala. I am guessing it has a greater tolerance to colder weather than the common bluetongue because of where it's found as well as the fact that shorter animals have less surface area in proportion to their mass than a longer animal of the same or similar species and are thus better able to retain their heat. Common bluetongues can be found over most of Australia. Only common bluetongues can be found in the Berra. Are they separate species that cannot interbreed, and therefore is there a border where we go from common bluetongue territory to the territory of the southern bluetongue, or are they races of the same species where the border is approximate and one race slowly turns into another? Or, if they are different races and not different species and there is no gene flow do they just choose to not interbreed? If so when they communicate in lizard language do they trade racist insults? Are they a ring species? 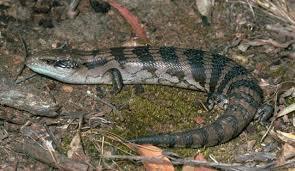 The photo below is of a common bluetongue. After having a good look at the southern bluetongue I opened a gate and travelled on a rough track to the Jerangle Cemetery, past an abandoned farmhouse. The photo above is of the Jerangle Cemetery. The grave above is of Margaret Brodie. It says she was born in 1824 in Scotland, which means she would have been classified as a "sterling." The grave above is of Henry Curtis, who died in 1917 aged 80. He would have been too young to be a convict. I wonder if he was a "currency lad" or a "sterling." It says he had died but was not forgotten. Considering he died in 1917 I doubt there would be anyone alive who could remember him, so we could say he has definitely been forgotten by those who knew him, although his relo's may still talk about him. The following very informative link put together by Barry Stephenson gives a list of those who are buried in the Jerangle Cemetery. 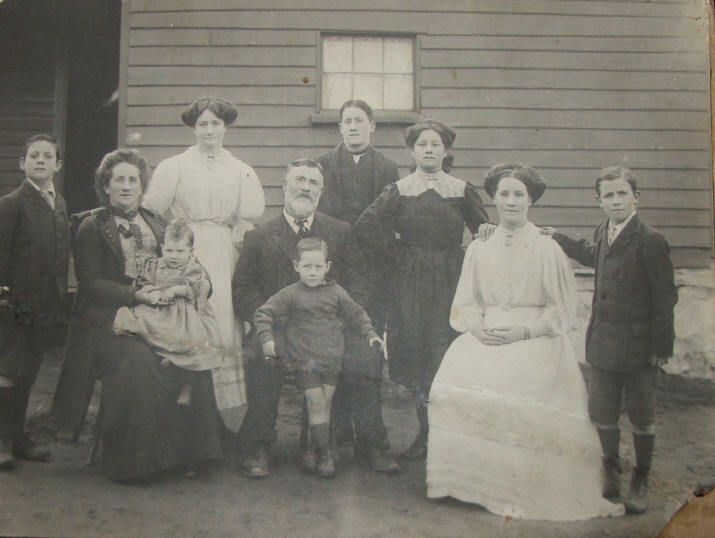 The list states that a Bridget Leahey died in 1916 aged 102, meaning she was born in 1814. If she was a currency lass who spent her childhood in Sydney she may have just remembered Yarramundi, who died in 1818, Lachlan Macquarie who was the governor of NSW until 1821, and Bungaree who died in 1830. There were voice recorders around in 1916. What a pity people like her did not have their memories recorded before they died. After visiting the cemetery I went back out the gate and looked at what remains of Jerangle's pub, which is not far from the said gate. I have no idea when it was opened and when it closed, but I'm sure it saw all sorts of action and experienced a lot of people vomiting and losing control of their bladders and bowels on its floor. Above is Jerangle’s pub known as the “Little Plain Hotel," which has been closed for many years. Above is a 1912 photo of the Philips family outside the Jerangle Pub. The baby being nursed is named John Phillips. John would be aged around 106 today, and if he's still with us he would probably be in a nursing home and once again wearing nappies. Hopefully John had a life that was long and happy, but not too long, as extreme old age would not be pleasant. Above is the remains of a ute from the 1920's, not far from the Jerangle pub. The pub and the ute appear to be on private land, which I am hoping will deter people from going into the place. I'm glad nobody has taken the old ute. Since my dad's generation are almost all either dead or too frail to drive, motorcars of that vintage are worth considerably less than they were 40 years ago, because it was mainly that generation that could relate to them and mainly that generation that wanted to acquire them in their middle age. Today many men of my generation are interested in buying cars of the 50’s, 60's and early 70's, the era of their youth. The ute in the photo would have had a life of very hard work. Above is Jerangle's Anglican church. I was told that nobody is allowed in without a protractor. Above is the Jerangle Public School which celebrated its centenary in 1992. While I was at Jerangle I saw and photographed a Tasmanian Devil, as shown above. 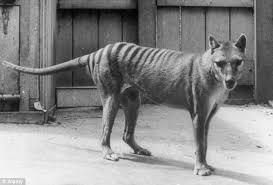 It must be a member of a remnant mainland population that survived competition from the dingo after the latter arrived about 5000 years ago. If it does not suffer from facial tumours like its Tasmanian cousins it could be useful for breeding purposes. Tricked you! The photo is of Coda defecating. Yes, I cleaned it up. 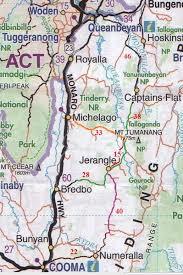 After seeing what I could of Jerangle, Coda and I, instead of going back the way we came, continued on the Jerangle Road towards Captains Flat until we came to the turnoff to Tinderry Road, which leads to Michelago. It's probably a slightly shorter route back to the Berra than through Bredbo, but it probably takes much longer as it is a rough and narrow road. As it had been raining the day before I wasn't going to go back that way, but I thought I'd take the chance considering it had been dry all that day. I was to find however, I should not have done so. In a few places it was very muddy and I only got through with my low-to-the-ground two wheel drive Barina by way of momentum and the mud being on the downward side of the hills. Coda and I drove on home without anything happening of any significance. Coda was ready for his meal when we got home, as was I, then we went to bed. I'm hoping the good people of Jerangle will not be offended by my off humour, particularly the ladies of the Jerangle CWA, as their organisation does a good job throughout Australia. Jerangle and its surrounding area is a beautiful part of the world and it will become more attractive to the residents of the Berra as our city becomes, by way of overpopulation, more congested and more densified. THE EMBEDDED YOUTUBE VIDEO BELOW IS ENTITLED "DAVE WHEELER VISITS JERANGLE"
After travelling exactly 7.2 kilometres along the Tinderry Road on the way home from Jerangle I did not see a member of the species shown above run directly across the road in front of me, which explains why I was not able to photograph it. FOR MORE MAINLY CANBERRA-BASED YARNS AND ESSAYS CLICK THE HOME BUTTON ABOVE.